Reserve one of the 180 contemporary rooms and suites at the Radisson hotel for a convenient home base in the heart of Nashville, TN. Plan your itinerary using our hotel’s free Wi-Fi, and stay connected with colleagues in our 24-hour business center. You can also keep up with your workout routine in our state-of-the-art fitness center and then refuel with a bite to eat in our on-site restaurants. Let stress float away while you lounge by our heated indoor pool, or catch a ride on our hotel’s complimentary shuttle to experience the nearby sights of Music City. Our shuttle also provides transportation to Nashville International Airport (BNA), so you can catch an early morning flight with ease. Savor the flavors of Nashville with a made-to-order omelet at 1112 Urban Grille in the morning, and later enjoy Nashville hot chicken for lunch and a mouthwatering cheeseburger for dinner at 1112 Bar & Grille, located on site. Afterward, grab a cocktail, beer or glass of wine at the bar for a fun night out with colleagues or loved ones. If you prefer to stay in your PJs, order room service for a relaxing night in. 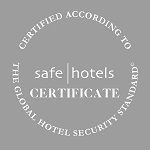 This hotel has been audited and certified in accordance with The Global Hotel Security Standard© of Safehotels Alliance AB.